Thumbnails are small images, either icons or a still picture from the movie, which represent the video to viewers before they begin to watch. The primary location for thumbnails is within the Channel Package. In the channel selection, there is a list of channels or files inside the package. Each is represented by the channel name and a thumbnail image. To upload a thumbnail, go to the tab for any Live or On Demand video. The thumbnail part will be in the lower-middle, next to the company logo. For video on demand (VOD), you can choose between one of four previously established images from the video. Alternatively, you can your own image. 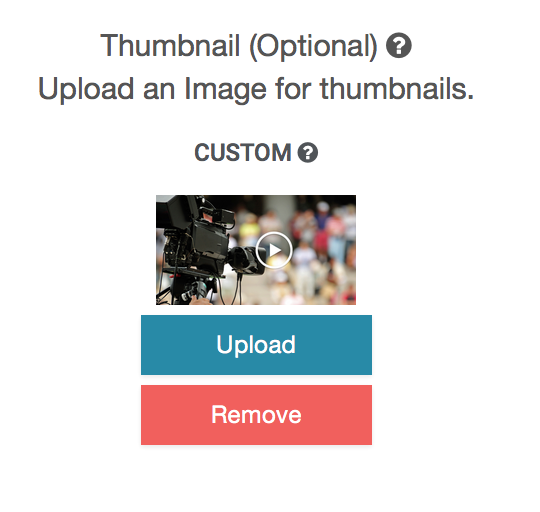 For live content, you only have the option to upload. The image circled in blue represents the current selected image for your content. DaCast supports JPEG, PNG and GIF formats. For GIFs, you can upload animated files, but the channel will only show the first frame. Additionally, transparent elements on GIFs and PNGs will be replaced by black elements. Note that images should be less than 1MB in size. A Splash Screen is an image that covers the entire viewable area of the player when the content isn’t playing. When do Splash Screens Appear? Splash screens will first “splash” onto the video area for a few seconds before the video begins to play. You can use this “splash” as a loading screen or preview. In addition, if your live stream is offline, the splash screen will appear as a background behind any system messages, even including the paywall if you monetize your content. For content not set to auto-play, or after a video on demand has finished, the splash screen also appears until the viewer clicks play. In addition, the optional DaCast Viewer service uses the Splash Screen to represent your content to viewers. Similar to uploading a thumbnail, go to the tab for any Live or On Demand video. The splash screen part will be in the lower-right, next to the available thumbnails.